"Chaos in Chiapas, Mexico: African & Haitian Migrants Are Stopped At Mexican Border In Chiapas- Entry DENIED. Central Americans are not the only migrants entering Mexico at the southern border: more than 500 Africans, Asians and Haitians have also arrived recently in Chiapas. Migrants from the Congo, Cameroon, Angola, Senegal, Sierra Leone, Uganda, Nepal, India, Sri Lanka, Bangladesh and Haiti crossed into Mexico from Guatemala in the final days of February and the first week of March, according to a report in the newspaper El Universal. The migrants voluntarily reported their entry to immigration authorities and requested transit visas that will allow them to legally continue their journey to the United States’ southern border, where they plan to seek asylum. More than 1,600 migrants demand safe-conduct in the station of the National Institute of Migration (INM) of the city of Tapachula, Chiapas." This is just the start. Over a million are coming. These people said that they flew to C. America. They said they gave all their money to the smugglers. Mexico is being culturally enriched and they should embrace the diversity. Well, they have broken through the border of Southern Mexico. Mexican citizens are pissed. These people are taking over people's houses when they are away at work, eating their food, sleeping in their beds, and in trashing the place. Neighborhoods are starting to take things into their own hands to keep these people out. Oh, and there is now some kind of African fever that has spread among many of the "migrants," and this fever is now spreading among the Mexican people who live in Chiapas. Alex Backman is investigating this and will let us know what he finds out. Trump threatening to send the migrants to U.S. sanctuary cities has backfired, because the migrants are now saying that Trump has surrendered to the U.N. policies and is going to protect them by sending them to cites where they can not be deported and they will be fed, housed, and get jobs. 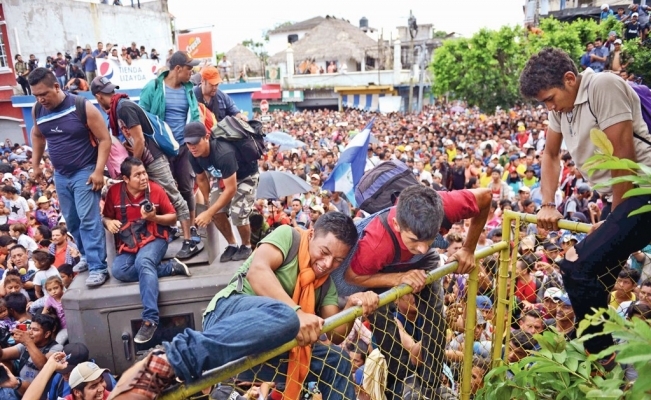 This is a photo from March 28th at the southern border. It is from an AP reporter. Mexicans are racist? No way! I have to wonder - why is the worlds leading democracy so weak that it can't make things better for the people of South America? are things so dire for them that they have to walk thousands of miles to come up here to escape? wtf? The Inter-American Development Bank (IDB) predicts that Latin American economies will grow 2.2 percent this year and inch up to 2.6 percent growth in the 2018-2020 period. Venezuela, where the economy is on life support, is a notable exception. While economic growth in the region is welcome after a sluggish year in 2017 and two straight years of economic contraction in 2016 and 2015, "growth is too slow to satisfy the desires of the region's middle class," said José Juan Ruiz, the IDB's chief economist. It isn't the poorest of the poor coming in. It's the lower middle class and the hardened criminals that pay an average of 7 thousand dollars apiece to smugglers. They come for the freebees and then they send the money back home where they will return once they've accumulated enough to live like kings there. Remember the "pig food lady" who was recently arrested for assault? She had an Instagram account showing she lived high on the hog in Honduras. I am blaming this on Trump AND especially CONGRESS. ALL OF CONGRESS. they could have fixed this years ago by changing the asylum laws, chain migration, and catch and release. we would not even need a border wall except maybe in a few high traffic cities. tossing the CIA/DEA drug network would also help a lot. just decriminalize mary jane and legalize the hard drugs with strict limits on how often you can buy, how much, and control the quality so it is not contaminated. recreational user can buy once a week just enough for a good time for the evening. period. anyone caught buying for someone else is going to pay a fine. do it again, you go to prison for 6 months. etc. use the drug war money for treatment and education. if you are a certified by a doctor addict, you can get legal drugs more often, but just enough to support your level of addiction and you need to be in treatment to also get the more frequent buyer program. the program will reduce your levels slowly and give you supplements to support your body coming off of drugs (vitamins, stuff that eases withdrawals, etc.). I used to coke once a week. did that for a few years. then I decided I like crystal better. switched to that for a few years. just one night; once a week. that is not addicting. they can sit down with people who used to do drugs and drug treatment folks and find out how much is a person can do and not get addicted. millions of us did drugs once a week for many years. we held jobs and kept relationships. then we said, ok, that was fun; time to stop, get married, have kids, get a better job. just don't keep doing it. that is when it gets a claw on you. but once a week or couple of times a month is not addicting. there are those unfortunate few who just have some kind of genetic predisposition or something in their mind or heart that is not right. those are people who if you take their drugs away they will just become alcoholics or addicted to food or something. i don't know why they are that way. mostly I think it they are trying to physical kill some kind of emotional pain, physical pain, or soothe themselves. they were probably abused in some way or not nurtured. there may be some who have a genetic problem like they can't detox it or something. maybe 2X a month. that might be safer and people can still have their d*mn drugs. because drugs will never be stopped. it is like prostitution, gambling, smoking and drinking -- it will never be stopped. at least this way we can empty the prisons for the most part, unclog the courts, stop the asset forfeiture seizure, clean up the cops, clean up the feds, tax the purchases, set up lots of treatment, stop the overdoses, deal a huge financial blow to the cartels, clean up the political money, etc. The migrants see the reality of what Trump is doing. I think you are mostly right. it is not the poorest of the poor, mostly that is. they are the ones that care enough to stay and do what they can to take care of grandma who can't walk all that way. maybe some of the young poor are making the trek, but most poor people have extended families that they would never leave. they might send one son, but I doubt he would feel like it was acceptable to leave. There SEEMS to Be a SHITTON of AFRICANS in That Invading Army!